.......53 Buddhas and Me .................My Life Adventures.....: "Craft Expo"
There's nothing better to beat the blues than with kind words from friends - thank you all - and indulging in something that gives you joy and inspiration. Today I went to "CraftExpo" at the "Royal Exhibition Bu ildings" in Carlton. I spent way to much money on things I love and I am totally happy about that. I also sat in on a couple of classes and soaked up everything I could. It is amazing how anything creative gets my senses and mood into a very high vibration level. The Royal Exhibition Buildings are such an amazing place to visit. 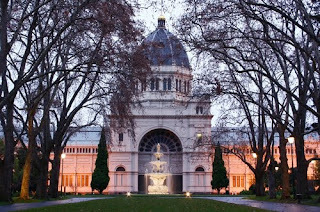 The buildings were built in 1880 and then on 9 May 1901, the Royal Exhibition Building hosted the opening of the first Australian Federal Parliament. The decorative painting and artwork on the walls and ceiling of the main hall are absolutely amazing. Wow, what a gorgeous building! I would love to see inside that one! What a beautiful day for you, what type of classes did you sit in on? And this building is breathtaking! Yup, continue to be creative and you will continue to shine... isn't life grand?